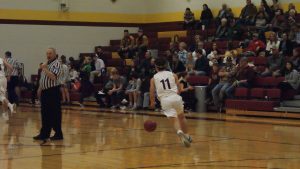 As the Lancer Classic came to a close, the St. Paul Indians looked to make a mark on the tournament in the final day of tournament play. For the Lady Indians, they come off a tough loss to Parsons which resulted in the Vikings making a last-second buzzer beater. Following the loss, St. Paul (8-2) met with a familiar opponent, the Southeast Lancers (8-3), for the 3rd place game, Jan. 18. Last time these two teams met, St. Paul took the win 35-28. In the first, junior Emily Hutcherson would control much of the offense scoring 8 of St. Paul’s 15 points in the quarter. Southeast would stay within reach scoring 8 points bringing the score to 15-8 at the end of the first. For St. Paul in the second, junior Katie Coomes continued her hot hand as of late scoring 6 of the Indians 8 points as the Lancers started to pick it up scoring 10. But the Lady Indians would hold the advantage at the half leading 23-18. The Lady Indians had some trouble in the third as it seemed Southeast couldn’t miss. Southeast brought the score within one at the end of the third as St. Paul maintained their lead 33-32. St. Paul’s stifling defense stepped it up tremendously as they would hold the Lancers to no points in the 4th quarter. The Lady Indians went on to win and take 3rd place in the Lancer Classic, 46-32. Coach Tuck and his Lady Indians improve on the season to 9-2 overall maintaining their undefeated league record of 5-0. Junior Katie Coomes has been on a tear as of recent as she finished the game with 18 points total on the night. The Indians had several others in double digits; Hutcherson (13), Wiatrak (10). For the boys, they came into the matchup following their game against the Erie Red Devils where they were able to escape 47-43. In their next game, the Indians (6-4) faced the Pierce City Eagles (8-6). It was an offensive explosion for the Eagles in the first quarter as both teams couldn’t miss. Junior Adam Albertini would help the Indians’ effort as well scoring 5 of St. Paul’s 11 points. At the end of the first quarter, the Eagles led 16-11. The second quarter became more of a defensive battle as baskets came at a premium. St. Paul then would be held scoreless in the second quarter as Pierce City’s defense clamped down on the Indians. From there, the Pierce City would pour in the points as St. Paul had no answer offensively. The Eagles would go on to win the matchup 49-21. St. Paul heads into their next game with an overall record of 6-5 while maintaining an undefeated league record of 5-0. Scoring came at a premium for the Indians as senior Kenny Haney led the scoring for St. Paul with 7 points. The Indians will travel for their next matchup against West Elk, Tuesday, Jan. 22.